Give a boost to your cleanser’s performance with the Philips Visa Pure MS590/50 Men Brush Head Replacement. Suitable for normal to combination to oily skin type, this brush head has 17,000 power bristles each with a diameter of 75 micron that clean even those areas of your face, that your hands can't reach. They remove oil, dirt and dead skin cells thoroughly, leaving your skin squeaky clean! Additional Information: Philips India is focused on improving people’s lifestyle by gathering consumer insights to deliver integrated solutions. This brand believes you should be able to enhance your look with the help of technology and innovation. All the products are designed to deliver visible results that last - and to empower you to look and feel confident every day. Explore the entire range of Cleansing Brushes available on Nykaa. 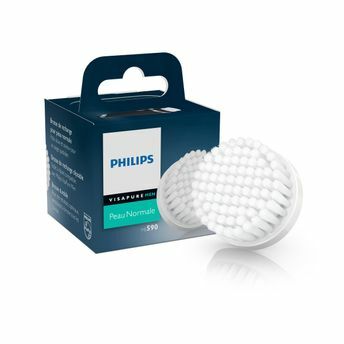 Shop more Philips products here.You can browse through the complete world of Philips Cleansing Brushes .